The problem with Thanksgiving dinner is that everybody is running around in the kitchen trying to cook something or warm something up at the last minute. It’s also hard to keep your mashed potatoes warm without the use of steaming gravy. No worries, I’ve got a great solution. Moni’s Make Ahead Mashed Potatoes come from a sister Spadette. There is absolutely nothing dietetic about this recipe, but it is a day for feasting, after all. You can make them the day before, refrigerate and pop them into the oven during the last hour of preparing your holiday meal. Plus, they are delicious. I decided the last thing I needed to do was cook myself an entire casserole dish of mashed potatoes a week before Thanksgiving, so there are no photos with this. You don’t need them if you know how to mash and I’m sure there are plenty of readers out there who are mashers. Okay, here’s Miss Moni’s famous recipe. It’s probably been handed down for generations or something. Mash hot potatoes in large bowl. Add cream cheese and butter in small pieces. Beat until both are melted and completely absorbed. Blend in sour cream. Combine eggs, milk, onion and seasonings and add to potatoes. Beat until light and fluffy. 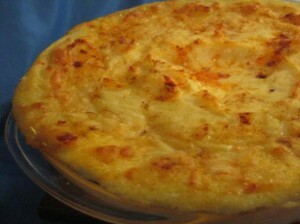 Turn into a greased 9” casserole dish and refrigerate several hours or overnight. Bake @ 350 for 45 minutes. That’s it! And those mashers are extra yummy. Tomorrow is column day and Friday I’m going to try a brand new recipe. Not sure it’s really a Thanksgiving one, though. And I bet you’ve never heard of it! Spreading feasting throughout the world…one recipe at a time.